Install the Vue CLI globally. Install the latest version of Yeoman and the Yeoman generator for Office Add-ins globally. Use the Vue CLI to generate a new Vue app. From the terminal, run the following command and then answer the prompts as described below. When responding to the prompts that are generated by the previous command, override the default answers for the following 3 prompts. You can accept the default answers for all other prompts. Each add-in requires a manifest file to define its settings and capabilities. Navigate to your app folder. Use the Yeoman generator to generate the manifest file for your add-in. Run the following command and then answer the prompts as shown below. After you complete the wizard, the generator creates the manifest file. To enable HTTPS for your app, open the file package.json in the root folder of the Vue project, modify the dev script to add the --https flag, and save the file. "dev": "webpack-dev-server --https --inline --progress --config build/webpack.dev.conf.js"
In your code editor, open the folder My Office Add-in that Yo Office created at the root of your Vue project. In that folder, you'll see the manifest file that defines the settings for your add-in: manifest.xml. Open the manifest file, replace all occurrences of https://localhost:3000 with https://localhost:8080, and save the file. Open the file index.html (located at the root of your Vue project), add the following <script> tag immediately before the </head> tag, and save the file. Then add the following code in that same location, and save the file. Open src/App.vue, replace file contents with the following code, add a line break at the end of the file (i.e., after the </style> tag), and save the file. From the terminal, run the following command to start the dev server. In a web browser, navigate to https://localhost:8080. If your browser indicates that the site's certificate is not trusted, you will need to configure your computer to trust the certificate. After your browser loads the add-in page without any certificate errors, you're ready test your add-in. 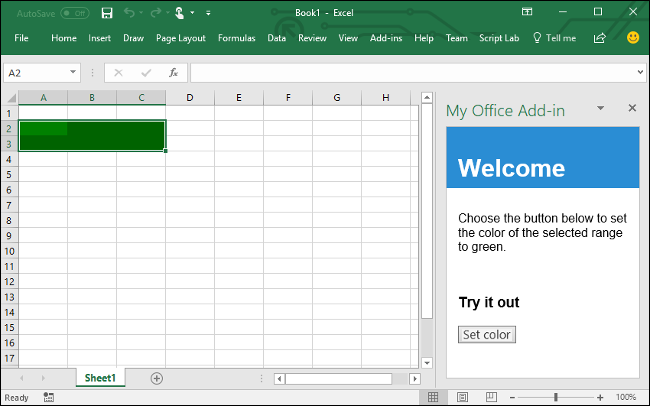 Follow the instructions for the platform you'll be using to run your add-in and sideload the add-in within Excel. In Excel, choose the Home tab, and then choose the Show Taskpane button in the ribbon to open the add-in task pane. Select any range of cells in the worksheet. In the task pane, choose the Set color button to set the color of the selected range to green. Congratulations, you've successfully created an Excel add-in using Vue! 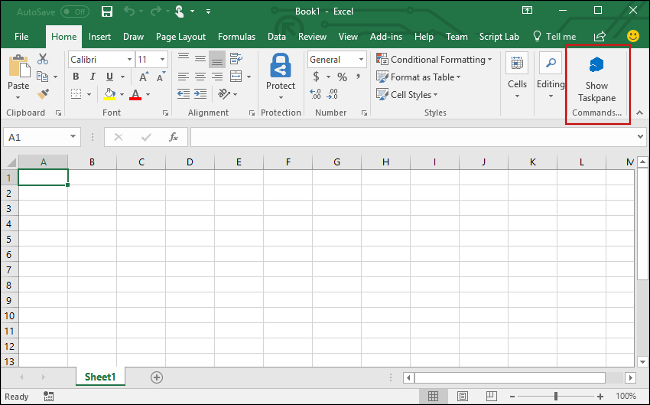 Next, learn more about the capabilities of an Excel add-in and build a more complex add-in by following along with the Excel add-in tutorial.